While others were busy packing 75+ interfacing orders that must be shipped on Tuesday...I sneaked away to save my sanity with a simple, quick little sewing project. This pink batik top was made from the Romeo & Mae "Milla" pattern, made for my sweet little friend, Julianna, age 3. Yes, it is simple enough that I could have drafted it myself...but..when I see something on Etsy, I don't think it is right to copy another designer's entire concept. So I bought the pattern. However, this time I think I could have done a better job of drafting this style. Well, maybe that is a bit unfair. Let's just say I would have drafted it differently. Why? The facings are the same for front and back, and little tucks must be made for the facing to fit the front. In my opinion, this made the front neckline quite bulky. So, for this design, I made some changes. First I shortened the pattern to make a Top, Then along with lowering the neckline by about 1/2", I made the front inset wider, and drafted separate facings for the back and front. 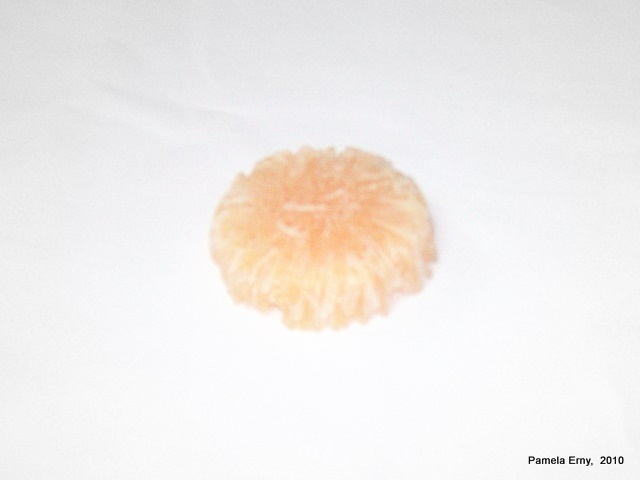 I also added a banded hem and finished off the top by adding a flower with a beaded center. That just about sums up my changes. Basically it is a good pattern, but I think more advanced sewists would also choose to redraft the facings. Uh-oh...someone noticed I was gone! I better get back to work..hey wait a minute, I'm the "boss"! LOL! Luckily it is fast and easy to get a cake of beeswax nice and smooth again. 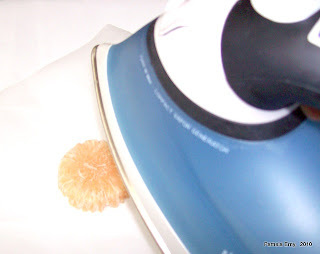 First, lay a piece of baker's parchment paper or aluminum foil on top of your ironing board. 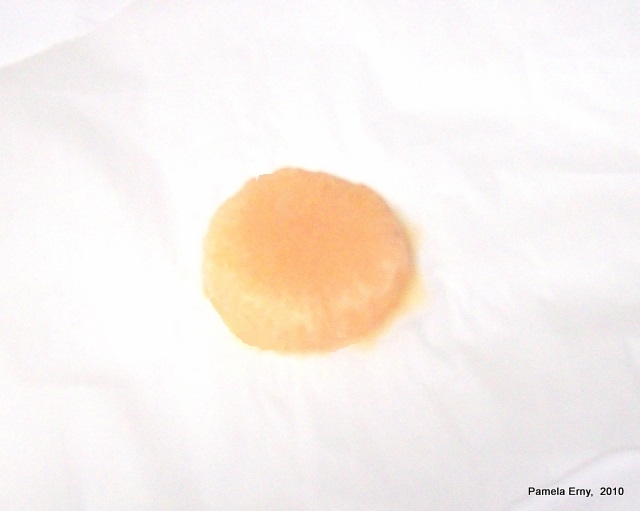 Next, place your crumbling beeswax on top of the parchment paper (or foil). Now with a hot steam iron...hold the iron above that poor pitiful crumbling wax, and give it a few good shots of steam...being careful not to actually touch the wax with your iron. Here is my nice smooth beeswax cake after steaming. Yes, some of the wax will melt and you will lose a bit...but it sure beats running your thread through a scarred cake of wax and dealing with the crumbs ! If you think this little tip is useful, please take a moment and vote for me by clicking the black and red box (located to the left)...thanks ! 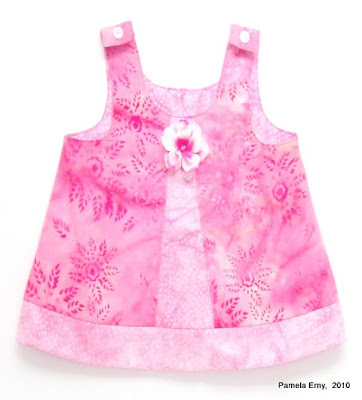 The first top/tunic is made from Amy Butler cotton fabric for 8-month old Brooklyn. It is #3, Ottobre Issue 01/08. 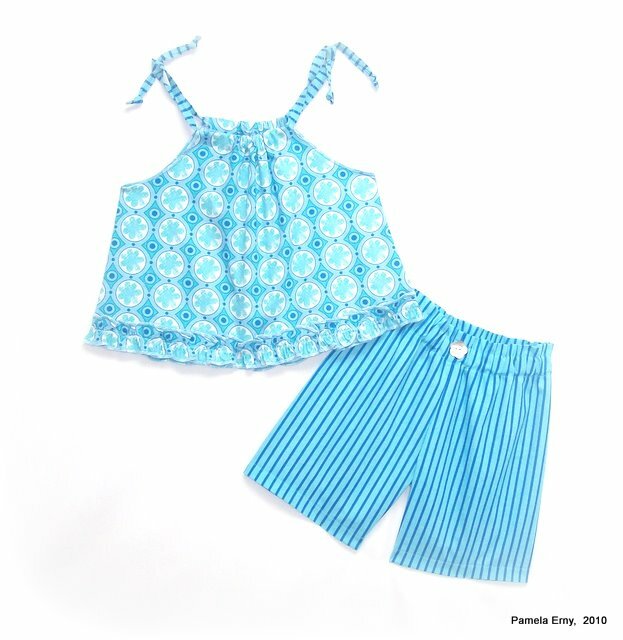 The blue outfit, also for Brooklyn, is a quick little set made from lightweight cotton woven. The pants are #6 from Ottobre Issue 04/09, Top is #1, from Ottobre Issue 01/08. I added a "euro-ruffle" to the bottom of the tunic for some extra detail.